Discounts maybe available for commercial use customers such as car delivery/collection businesses. Please ask for a quote. DI BLASI's new R70 electric moped combines foldability with a clean electric engine, to offer unparalled versatility ... and fun. The Di Blasi R70 offers class -leading comfort and safety, in a unique folding package. Folded it takes up less room than its rivals, while open the wheelbase ensures a stable ride even at maximum speed. Not forgetting that the moped also has EURO 2 Type Approval under EU regulations. The folding mechanism is quick and simple allowing the moped to be folded to the dimensions of a bag in 4 seconds with three simple steps, without using tools and without the need to remove or adjust any part, and of course it is just as quick and easy to unfold it for use. 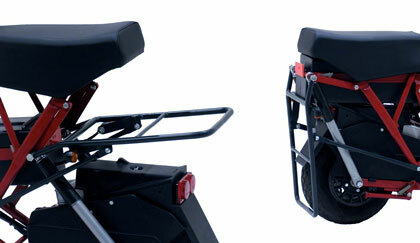 For enhanced practicality the moped is supplied with a factory fitted rear luggage rack. The electric motor is simple in operation, resulting in a much less maintenance. With no gears to worry about the R70 offers ease of operation and is ideal for those inexperienced on-two wheels. Is clean, quiet, and unobtrusive. It also resistant to overheating meaning it can be stored quickly and safely in confined spaces - see the video below. Many city authorities offer fiscal advantages and financing when purchasing electric vehicles. Electric vehicles are often the only ones allowed in areas that are closed to normal motorised traffic. Spares: For spares, please note the reference of the part you require, then contact us here at Concept Edge and we will order it for you.